The other day, we talked about cleaning your showerhead with vinegar, but today we’ve got a homegrown tip from the EcoRenovator forums to share with you: rhubarb can get rid of hard water stains. 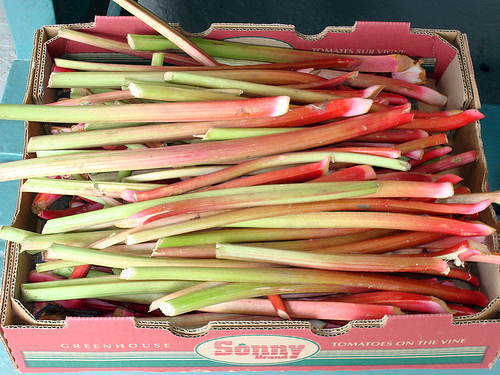 [GoogleAdGoesHere] Member bennelson did some research on the active ingredient in most hard water removers (which is oxalic acid), and found out that this same ingredient is found in common rhubarb. Luckily he had some growing in his garden and was able to go ahead and pick a few leaves. And guess what? It worked! Thanks for the info, bennelson, this is definitely a great, natural way to clean around the house. EDIT: I was reminded by a friend that you should not eat rhubarb leaves, so keep that in mind. Thankyou for sharing this great cleaning tip. The acids can help or harm depending on where they are used. You can make a great mixture from the leaves and kill garden pests as well! I know, hard water is a bummer. I’ve never tried rhubarb. It sounds messy. We found an easy water treatment solution. My husband got a Scalewatcher electronic descaler. Since then all the scale in the showerhead and around faucets is gone, my psoriasis has disappeared, we no longer need to use skin moisturizer, hair is squeaky clean, no more hard water spots to clean. Also our water heater is heating up the water much faster than before, I guess it’s gotten cleaned up inside. We got ours from http://www.scalewatcherUSA.com because they support non-profits like Greenpeace and Oxfam.